Lordy, I can't believe my husband is 40! Even worse is that I'll join the club in 11 short months. 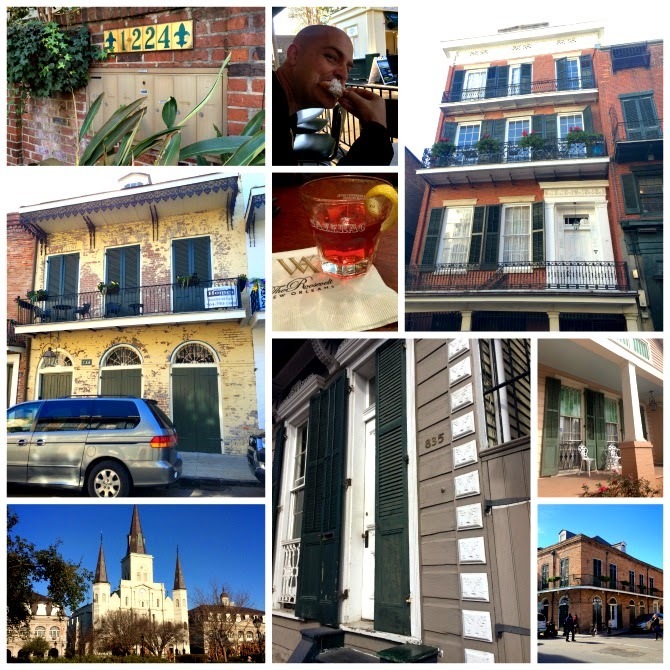 We had wanted to celebrate by traveling somewhere fun, and New Orleans was the perfect destination. Easy to get to, wouldn't require a car, and there would be endless great food/drink options. Everyone should experience New Orleans at some point in their life. It's such a unique, colorful, noisy city filled with a never ending sense of revelry. It can be overwhelming and exhausting, but we loved every minute of our trip. To spare you a lengthy recap, I'll just highlight some of our favorite things, and what I consider to be "Must-Dos" should you visit NoLa. 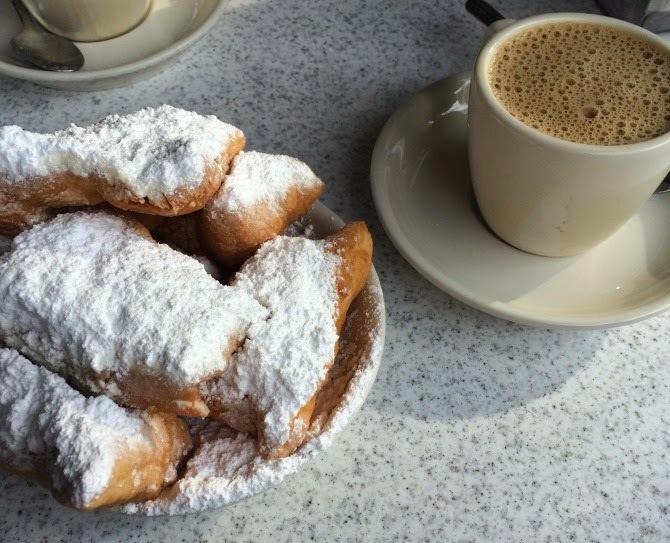 No trip to New Orleans is complete without at least one stop at Cafe du Monde for some hot beignets and coffee. We actually made it twice. The line is long on the weekend, so try to go first thing in the morning if you can. There's a huge patio, and the people watching is spectacular. If you're lucky, you'll be serenaded by a street musician. We tried to venture away from the French Quarter for most of our dinners, and enjoyed great meals in two different neighborhoods. In the Warehouse District, we celebrated Hank's birthday with an incredible dinner at the James Beard Award winning Peche Seafood Grill. While the whole meal was spectacular, it's going to sound weird that the fried bread appetizer was one of the most memorable parts. Don't knock it til you try it! We also went to the opposite side of the Quarter to the Bywater section, and had a great patio dinner at a neighborhood restaurant called Oxalis. Oysters! I don't eat them, but figured I should at least try them while visiting a city that helped make them famous. We ate an early dinner at Acme Oyster House, and lucked out with a seat at the bar where we could watch the guys shucking the oysters. I knew I wouldn't be able to stomach a raw oyster, so I opted for the Chargrilled version topped with parmesan and an herb butter sauce. To die for! Both lunches were in the gorgeous Garden District. We had a late lunch at Camelia Grill, an old school diner that serves up amazing greasy burgers and shakes (and also breakfast all day). This spot is extra special, because my grandparents used to eat here on date night decades ago when my Papa was a professor at Tulane. Our last meal was at a corner sandwich spot that came highly recommended via Yelp. The Grocery is not really a grocery at all, but they do serve up some mean pressed sandwiches. I went with the Pressed Creole Reuben, and Hank had a Muffuletta, and both were amazing. Pat O'Briens. Duh. It's the most touristy thing you can do, but I can't think of a more fun way to get the party started! We lucked out with bar seats in the room with dueling pianos, and had a ton of fun watching the show. You have to have something there, if for nothing else tradition's sake. Our first night in town we caught a show on the small stage at House of Blues with Luke Wade from The Voice. He put on a great show, and it was a fun way to kick off the trip. It's a little more commercial than we would normally do, but we thought it was fun to see someone that we enjoyed watching on the show. Put this on your DO NOT MISS list: Bacchanal Wine in Bywater. Take a cab and get there early so you can grab a table in the back. You can buy bottles of wine in the front, pick up some glasses, and settle in the back for some really great jazz. There's a great video on the website that shows how cool this place is (way better than my grainy pictures). It truly is a hidden gem. Order a Sazerac (you can get them just about anywhere, but the fancy Roosevelt Hotel bar is a fun place to drink one). On Monday morning we went on a 6 mile New Orleans Jogging Tour. The weather was amazing, our tour guide Marcus was everything you expect from a New Orleans local, and the tour itself was a ton of fun. We jogged an easy pace, stopped at plenty of sights, and had a great time. It was such a fun and different way to see the city. Two highlights were Peyton Manning's childhood home (his parents still live there), and Sandra Bullock's house. Half the tour was in the French Quarter, and the other half was through the Garden District. If you've had your fill of the French Quarter, hop on the trolley to the Garden District, and then walk halfway back down Magazine Street. Tons of shops, restaurants and bars- it's a slower pace with plenty to see. Be sure to also stop at one of the cemeteries. 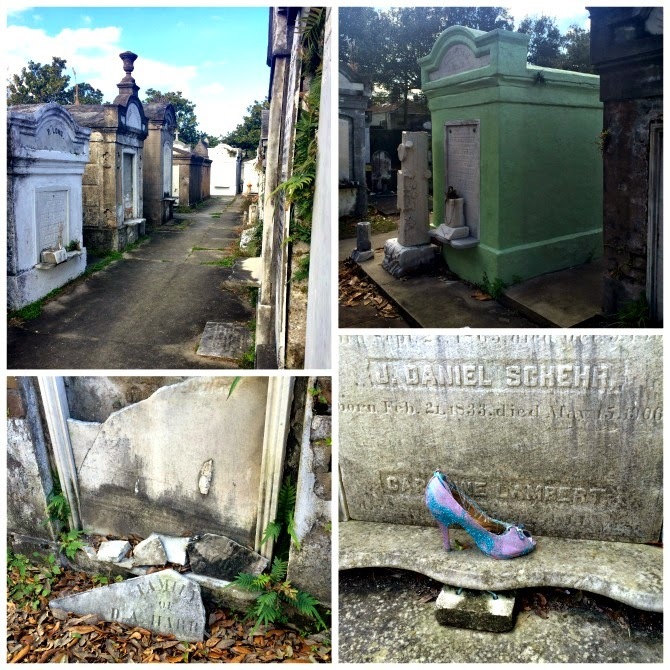 We visited the Lafayette Cemetery in the Garden District, and there were all kinds of interesting finds. The above ground tombs have a fascinating history, and you can read more about them here. Some of the tombs had as many as 20 family members in them. You can take a tour to learn more info, but we just walked around by ourselves. Last but not least, make sure you allow enough time to really walk the French Quarter. Not just Bourbon Street (gross), but all the little housing sections around it. I just couldn't get enough of the architecture on every single block. Ah I'm going to have to pin this! Some girl friends and I have been talking about take a tip in May. I've never been!! I love the idea of the jogging tour, that would be a lot of fun for us! So I'm now planning my NOLA trip and was wondering where y'all stayed or which area would be good for a group of 4 girls... We don't really want to party, but a place with good eats, lounges... Do you have any other advice? I already brought up the jogging tour, but it was turned down. I still think I would really like it though! I'm trying a running tour in Boston this weekend, so I'll have to see how it goes. Anything helps! Thank you!